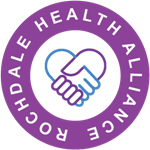 The Rochdale Health Alliance (RHA) was established in 2016 by GP practices from across the Rochdale Borough to streamline the way in which services are delivered. Each of the 3 area’s of the borough elected GP’s to represent their locality and become directors on the board. The board is supported by a management team who ensure the day to day functioning of the organisation.